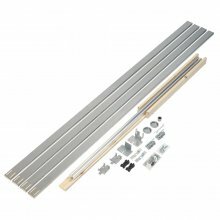 Pocket Door Kits are an expert way to add a door to a room while conserving every inch of wall and floor space. Pocket doors cleverly slide into a wall cavity, making for a discreet door opening. Henderson is a leading brand and manufacture pocket door kits in a variety of sizes, ensuring there is a door suitable for every entrance. We ship pocket door kits to locations throughout the UK and across Europe. If you would like any further assistance from our fully trained team, you can contact us on 0121 418 3415 or via email.